An average capital expenditure (capex) of US$8.4 billion per year will be spent on 249 oil and gas fields in Nigeria between 2018 and 2020. 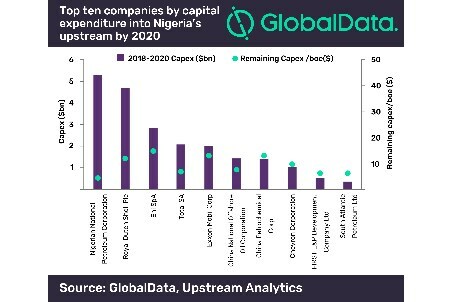 Capex into Nigeria’s oil and gas projects will add up to $25.3bn over the three-year period in upstream capex by 2020, according to GlobalData, a leading data and analytics company. Ultra-deepwater projects will be responsible for over 28 percent of US$25.3 billion of upstream capex in Nigeria, or US$7.2 billion by 2020. The shallow water projects will account for 26 percent of upstream capex with US$6.7 billion by 2020, while deepwater and onshore projects will necessitate US$6.0 billion and US$5.5 billion respectively in capex over the period. GlobalData expects that Nigerian National Petroleum Corporation will lead Nigeria in capex, investing US$5.3 billion into the country’s upstream projects by 2020. Royal Dutch Shell Plc and Eni SpA will follow, with US$4.7 billion and US$2.8 billion respectively. Zabazaba-Etan Project, a planned shallow water conventional oil field, will lead capital investment with US$4.8 billion to be spent between 2018 and 2020. Nigerian Agip Exploration Ltd. is the operator for the field. Owowo West, a conventional oil field in the Niger Delta Basin, will follow next with a capex of US$1.8 billion. Esso Exploration and Production Nigeria Limited is its operator. GlobalData reports the average remaining capex per barrel of oil equivalent (boe) for Nigeria projects at US$6.7. Ultra-deepwater projects have the highest remaining capex/boe at US$11.20, followed by deepwater projects at US$9.7. The shallow water and onshore projects have capex/boe at US$7.0 and US$3.3 respectively.